chicago deep dish adventure: stop #2. | sara rose. chicago deep dish adventure: stop #2. Pizano’s was another stop on my list. The fact that it juts happened to be about a block and a half from my hotel made it a MUST-do. While there was still a monsoon occurring outside as I relaxed in my room, I decided to go to the market across the street to snag a couple bottles of wine and some cheese, crackers and chocolate. Mm hmm. That’s a solid vacation in my opinion: your own deluxe king size bed, a big fancy flat screen, and all the wine you can drink without worrying about any kind of responsibilities. Holla! Well, this was around 7:00. After almost an entire bottle and about a half a block of cheese, I had decided that I had enough of the solo TV time in bed and I needed to get back out there. Downpour or not, I was determined to continue my deep dish adventure. Obviously, Pizano’s was the best option because of its super convenient location. I took the elevator down twelve floors, snagged an umbrella courtesy of the hotel, and cautiously walked through the revolving door out into the storm. I dashed down the street, through countless puddles, and finally arrived at my second pizza destination. Hooray! I ordered spinach dip (his recommendation of the two apps I asked about), and an individual sausage pizza. I had read on Yelp! that the sausage pizza at Pizano’s was pretty tasty, so I was excited about it. Got the spinach dip, pretty good. Pretty spinach-y. I liked it. Got the pizza … they forgot my sausage 😦 but I didn’t realize this until the next morning (of course I had to take some leftovers home with me). But overall, the pizza was still mighty tasty. 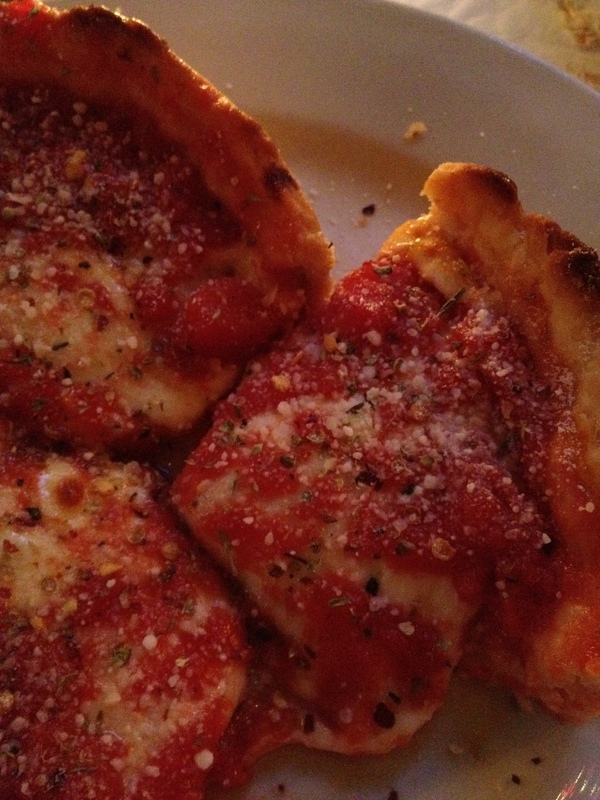 Flaky, buttery crust, prominent tomato flavor, and the cheese was awesome. I sprinkled a little parm and crushed red pepper on top for some extra flav-ah! To be COMPLETELY honest, I don’t really have a favorite between Lou’s and Pizano’s in terms of pizza flavor. Unfortunately, I believe I’d like Pizano’s better had I gotten the sausage on the pizza. The service, however, was tremendously different. 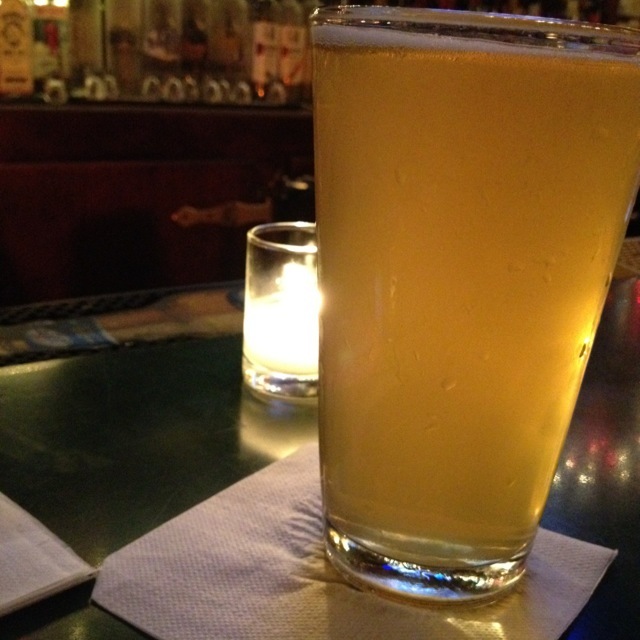 The bartender even bought my second beer and suggested I come visit him again the following night. Talk about a turn-around from my devastating service that morning! I should have gone … oh well. Next time! I’ll be back for that sausage pizza! 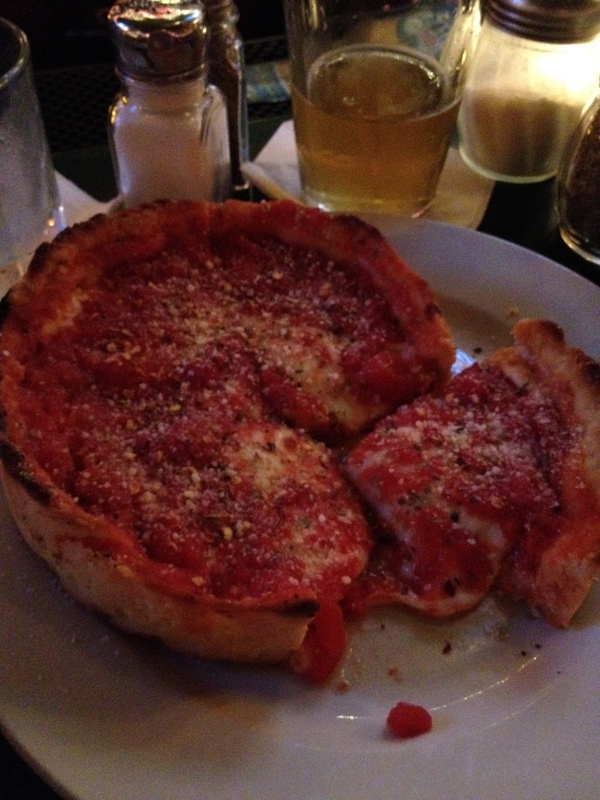 ← chicago deep dish adventure: stop #1.
chicago adventure series : about. chicago deep dish adventure: stop #1.